I thought I’d share with you some winter wedding inspiration on this cold and blustery day! Jayme and Ryan had a breathtaking setting for their wedding amidst the Appalachian Mountains in Pennsylvania. The Summit Inn served as the location for their vintage inspired garden wedding. The same place where Jayme’s grandparents married 64 years ago! Jayme wears the Cassandra wedding dress by Sarah Janks – a modern day classic. Chic, elegant, and simple, with a breathtaking back. 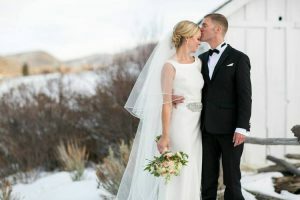 What a stunning wedding and what a beautiful winter bride!